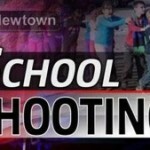 I think it’s disgusting that the far-left, liberal Democrats are using the recent tragic shooting at Sandy Hook Elementary School in Newtown, CT for their own political agendas by pushing for more gun control in the United States. 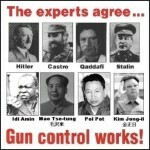 Research shows that GUN CONTROL NEVER WORKS but actually has the opposite effect. 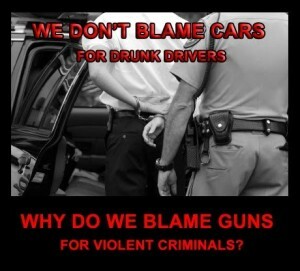 Banning guns from the hands of law abiding citizens is not the solution. How’s that gun control working in Chicago? 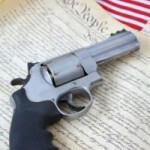 In spite of New York State having the fourth toughest gun law in the country, in 2012, the New York Police Department confiscated nearly 4,000 guns and they had more than 400 murders – and that’s just in New York City. It also should be noted that New York City Mayor Michael Bloomberg is spear-heading a nationwide gun ban campaign while his city (New York) has recently seen a huge spike in violent crimes. How’s that gun control working in New York? 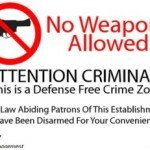 Gun control never works because criminals NEVER pay attention to gun laws or obey them. 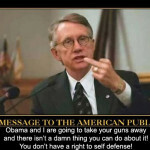 Gun control only creates more victims of violent crimes by disarming law abiding citizens. The radical, liberal left always likes to say that guns kill people. Well, if that’s the case then I’d like to send all of my guns back to the manufacturer for a full refund because they are obviously defective. I own several guns and I’ve had a few of them for many years and not one of them has killed a single person yet. There are more than 200 million guns in the United States and if guns kill people then by the liberal left’s logic there should be a mass shooting every day. That’s just ridiculous! The point is that guns don’t kill people any more than spoons make people fat or pencils make people misspell words. People kill people… they always have and they always will… whether there are guns or not. The reality is that freedom is messy and there’s really nothing much that we can do in a free society. You are always going to have crazy people that do crazy, senseless things. You can’t legislate insanity. He also notes that no one wants to talk about the fact that we’ve lost more than 6,500 troops in the wars in Iraq and Afghanistan and not to mention the suicides afterward caused by Post Traumatic Stress Syndrome and other factors. That doesn’t seem to generate a great deal of headlines these days. We have one million innocent and unborn babies die in their mother’s womb, sacrificed on the alter of convenience every year. That’s 3,700 babies, (our most innocent and vulnerable of citizens) murdered/aborted every day in the U.S. And yet we pay scant attention to that. And yet we wonder why horrible things like mass shootings happen. The problem is not the lack of more gun control but it is the human condition and man’s fallen and rebellious nature against God. People always ask, “Why do bad things happen to good people?” It’s because of OUR SIN (yours and mine) that even innocent people suffer, we are all guilty of sin and our sin affects everyone around us. No amount of legislation can fix that.